Well, fresh from CES, Parrot just unveiled the DIA, the first digital photo frame that you really will be happy to receive. The DIA is less like an old digital frame and more like a movie screen that has a picture projected upon it. The DIA’s LCD display is separate from it’s backlight, which gives your favorite photos a beautiful, designer friendly, transparent effect, very different from the digital frames of, well, just yesterday. The frame itself is fairly plain, with its controls on the top and the SD card slot and USB ports on the side. 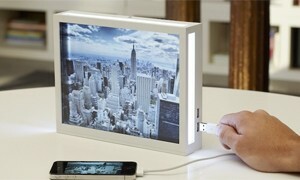 Photos are added by USB, SD or alternatively, you can send photos to the frame wirelessly via Wi-Fi or Bluetooth. DIA playfully provides some additional functionality by adding a few bells and whistles not seen before, with an unusual selection of preinstalled apps. Or you can consult the Frame Channel, and select your own apps. So, see your favorite pictures, check the news and weather, check the financial channel, Facebook, or just send pics directly to the frame with your iPhone. Yup, theres an app for that too. The Parrot DIA probably wont be available until February, and we don’t know for how much, but something tells me I won’t be stacking 5 of them in my closet for next Christmas.